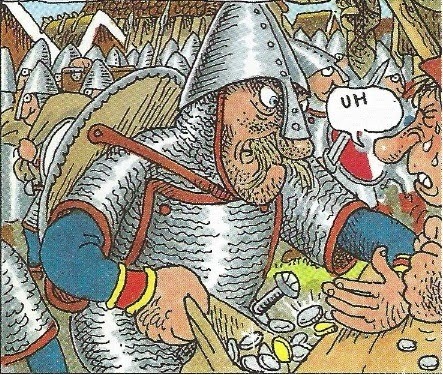 Vikings decided for their 3rd annual raiding party at Dorestad. The Anglo-Saxon Chronicle told us that In Somerset, England, Egbert was defeated in 836 at Carhampton by 35 Danish viking ships. A large group of probably Norwegian originated vikings attacked the Earn valley & Tay valley area in the Pictish kingdom. King Horik of Denmark sent his royal emissaries to the emperors court where he told the emperor that he was against the raids on Dorestad. Horik also complained that some of his emissaries were killed at Cologne, the emperor agreed to pay a purse full of coins. After the emperors yearly autumn hunting expedition new emissaries arrived meeting with a message from king Horik, that he had arrested and killed some of the responsible from the Dorestad raids, Horik then demanded more money. The Irish medieval tale "The War of the Irish with the Foreigners" tells us that the viking leader Turgesius (Nordic Thorgísl) forced Christians in Ireland, to participate in heathen religious practices with animal sacrifices under the firm leadership of his wife the völva Ota in the Clonmacnoise cathedral.